99% of the time, cats can clean themselves, using their tongue to do the heavy scrubbing. My own black and white cat has amazingly white fur all the time even though she spends most of her days outside in the garden getting up to mischief. Of course, not everyone is so lucky! Some cats have specific problems (like long fur) while others just seem to smell or attract dirt! Even if your cat absolutely hates water, there are tips and tricks to make bathing your cat easy, plus we’ve also compiled a list of the best cat shampoos on the market. When Does a Cat Need Bathing? Like I said, most of the time your cat can keep himself clean. Cats can lick most of their fur clean, and their skin produces oils that keeps everything healthy. Unfortunately, some cats are overweight, have existing health conditions or just getting older, and can’t always do what nature intended. It’s here that you might need to give your furry friend a little help. The first tip is the hardest, as it relies on forward thinking to that time when you’ll need to bathe your cat. By bathing your cat when it’s a kitten, she’ll get used to the idea of being in water, and the fact it’s not scary at all with her owner helping. Another tip is to watch your cat throughout the day, and figure out if there’s a time when she’s more chilled out. Cats always have their daily routine. Mine has breakfast, goes for a sleep until 2pm, goes outside for a bit and then comes for cuddles about 6pm – when we’re home from work. By watching your cat, you can formulate a time to bathe your cat easily. Use a brush first; this helps soothe the cat a little bit, especially if they’re used to having their fur brushed. You can also check for things like mites and fleas whilst brushing the coat too. When you start shampooing, use lukewarm water and a small amount of shampoo. For small cats, a washing bowl in the bathroom is a great idea, or just use the bathtub itself if your cat is larger. The bathroom can also be locked just in case your cat makes a run for it! Finally, give your cat a treat at the end. Cats do remember treats, and this act might make things better next time around! If you’ve decided it’s time to give your cat a little scrub, you’ll want to purchase a dedicated cat shampoo to wash them with. Cat fur and skin is much different than human skin, so it makes sense that they need a different shampoo. Here’s our roundup of the best shampoos available right now. The Soap Club, have been making shampoos for dogs and cats since 1984. Their current shampoo, is hypoallergenic, and doesn’t include alcohol. The Soap Club products are also made here in the USA. One of the top things a pet shampoo can do is not foam too much during bathing. Most pets hate bubbles, as they don’t understand that the soap can hurt their eyes! Thankfully, the Soap Club shampoo doesn’t foam too much, and smells nice. As I washed my cat in Soap Clubs shampoo, I could feel the moisturizer working its magic. One of the problems with washing any animal is that you’re removing vital oils from their fur and skin. With Soap Club, I could feel that wasn’t happening. All in all, the Soap Club shampoo was awesome to use, and really made my cat smell fresh. The only issue, was the price. It’s quite an outlay for what is basically shampoo – no matter how posh it is! Pros: Nice moderate lather, fresh smell and moisturizing. Cons: The most expensive shampoo on test. One of the main reasons you might want to shampoo your cat is the fact they could be sick, or suffering from a skin complaint. It’s here that oatmeal baths come in to save the day! They work by soothing the skin, while ingredients like aloe vera, shea butter and chamomile help to clean and calm the skin in equal measure. Like the Soap Club shampoo above, this one is made in the USA too. Contains aloe vera, chamomile and shea butter. Formulated to avoid stinging eyes. This is an oatmeal bath, which is a slightly different proposition to a standard pet shampoo. It’s probably one of those things you’ll only use now and again, before switching back to standard issue pet soap. The Oatmeal shampoo lathered up nicely, a little more than the Soap Club, yet because of the shea butter, it felt slippery and silky between my fingers. 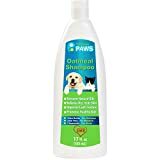 Unfortunately, we couldn’t test this product on a pet with a skin complaint as all our review team’s pets are in great health; however, we did give it a trial, and we could certainly see the oatmeal and feel the shea butter/aloe vera in it. Pros: A top shampoo for cats that have skin complaints. Cons: Still a bit pricey. NO MORE ITCHING: The natural shampoo that soothes the skin getting rid of itchy skin. SMELL GREAT: The shampoo that will leave your pet smelling so fresh and clean. SOOTHE SKIN INFECTIONS: Restore normal pH balance of the skin and soothe nasty infections. Back to normal pet shampoos this time, with a brand that costs a more normal amount. Earthbath promises all-natural ingredients, and the ability to cope with sensitive skin. Earthbath, is also available in a huge range of scents, from Mango all the way to Orange Peel! There’s also a clean version for super sensitive pets, and a bright coat version, if you want your feline to shine! Comes in a variety of flavours. For the price, this stuff is amazing! We tried the Eucalyptus flavour shampoo, and it really did smell like we were bathing our cat in minty freshness! The lather is pretty good too, and we think our cat preferred being bathed in this shampoo. Either that, or she had realised that staying still got her treats! One of the cool things about this brand is the fact it does include some of the ingredients that medicated shampoos do. So, if you’re looking for a long-term solution to your pet’s skin complaints, it’s worth having a go with this shampoo. Pros: Well priced and available in many flavours to suit your pet. Cons: None we can think of! For our last review, we thought we would look at another soothing shampoo for cats with skin conditions. Virbac is a well-known vets brand, and is often prescribed by them to treat skin problems. Available in 8oz or 16oz, there are sadly no fragrances; however, this is a serious shampoo for pets that need a little love to bring them back to their best. Slow release of ingredients, continues to work long after the bath. First things first, this shampoo smells medicated! It’s a very similar antiseptic smell you’ll find in many vet’s officers and hospital, and belies its medical origins. Even so, the shampoo is extremely nice to lather, and you get the feeling it’s doing good as it’s massaged into your pet’s skin. We could see the oatmeal content too. The price of this treatment is good too. It’s normal MSRP is not bad for something capable of treating most skin conditions. Pros: Cheap for what it is. Cons: Not a daily shampoo, more of a dedicated treatment when your pet needs it. For medicated skin treatments – The Virbac shampoo wins hands down. Ultra-medicated, we believe this shampoo will quickly sort dry skin and other issues. For daily use – The Earthbath comes in a huge range of flavours, and packs in all the ingredients you need.